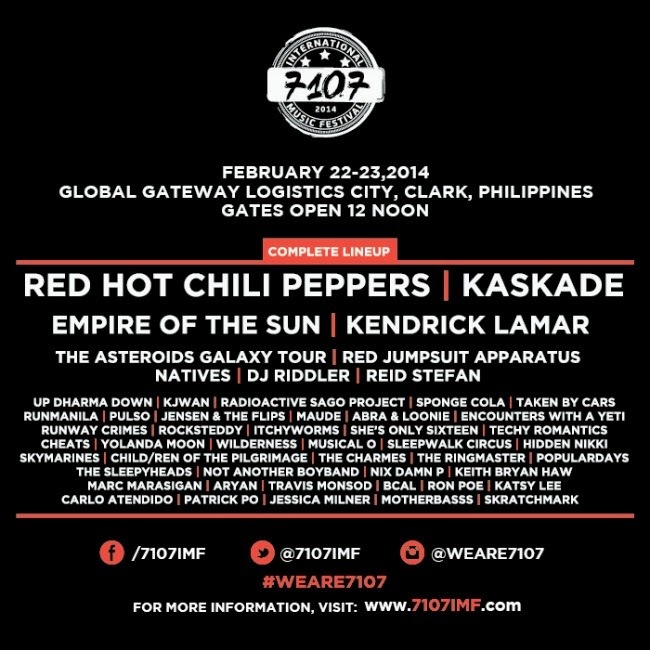 Presenting, 7107 International Music Festival's final and complete line-up! Prepare to party non-stop for 2 days with the RED HOT CHILI PEPPERS, KASKADE, EMPIRE OF THE SUN, KENDRICK LAMAR, THE ASTEROIDS GALAXY TOUR, RED JUMPSUIT APPARATUS, NATIVES, DJ RIDDLER, REID STEFAN and the finest local acts like RADIOACTIVE SAGO PROJECT, ITCHYWORMS, DJ RON POE, IP DHARMA DOWN AND MANY MORE!!! Now you know, it's time to hustle, gather your friends and grab those tickets. By the looks of it, they're gonna run out pretty fast! SAVE THE DATE: FEB 22-23, 2014.